In the face of death, two couples with radically different world views are grappling with a shared reality and an age-old question: To be or not to be – alive or together. 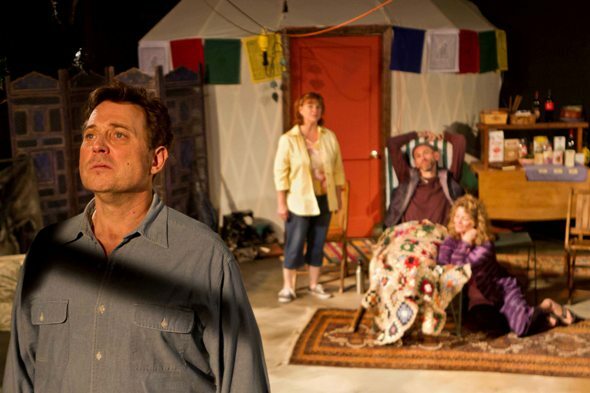 That’s the double push and pull of Jane Anderson’s witty, provocative and surprising play “The Quality of Life,” offered in a taut, fine-spun production at The Den Theatre. Bill and Dinah are conservative Midwesterners whose lives have been rocked by the brutal murder of their daughter. They aren’t talking much and the light has dimmed in their marriage. But Dinah manages to convince her husband that a trip to California – to visit her cousin Jeanette and her husband Neil, whose home was recently destroyed in a forest fire – might be good for all of them. For Jeanette (Liz Zweifler) and Neil (Ron Wells), the loss of their home isn’t even an issue. They’re happily secluded in the woods, sleeping in a yurt – a sort of portable, canvas-enclosed gazebo. Yet their life is hardly a lark. Neil is terminally ill with cancer. He has decided to skip the ordeal of chemotherapy, which might be fruitless anyway. More than that, he has resolved to avoid a miserable ending altogether by terminating himself. He has even picked a date, and it is soon. Into this charged, if outwardly placid, scene walk Bill (Stephen Spencer) and Dinah (Jennifer Joan Taylor). The cultural clash is instantaneous. Not only does liberal abuse of the Lord’s name by the happy resident campers annoy born-again Christian Bill, but Neil’s self-medication with steamed weed literally drives the uptight visitor from the campground. Dinah, it seems, is a more mellow soul, more indulgent and more together. She and free-spirited wood nymph Jeanette may not be so different; indeed, at a certain depth and in a way that cannot be immediately grasped, they have a good deal in common. Neil’s illness is the play’s driving engine. Everything turns about that, notably the way relationships evolve and the manner in which the four characters are recombined as the conversation moves through issues like life, death and the socializing value of a glass of wine. The dialogue about Neil’s cancer is specific and unflinching, and Neil leads it. He is still very much alive, an intellectual fully in control of his wits and usually in control of the conversation. It’s a delicate test of credibility, to be clearly dying and yet quite forceful at the same time, and Ron Wells – tall, gaunt and fiercely focused — brings it off with compelling conviction. What’s more, his physically waning Neil conveys genuine intellectual integrity. He’s a seeker of truth ever willing to consider all sides of an issue. It’s a virtue that Jeanette sometimes finds exasperating in her husband, and we see the proof more than once. Yet the further this skillfully crafted play moves along, the more evident it becomes that almost nothing is quite what it seems – starting perhaps with Liz Zweifler’s brave, smart, sassy Jeanette, who gets some big laughs in the early head-bumping between the buttoned-up Midwesterners and these merry anarchists. Then the laughter stops as our eyes (and sympathies) steadily shift from the guy with the cancer to the woman who must endure it with him. Zweifler’s crushingly human Jeanette gives earthy, solid meaning to life after death. Which brings us back to the other couple, the displaced visitors from the midlands, who’ve shown up reeling from the numbing emptiness of life after the soul-splitting death of their daughter. Jennifer Joan Taylor is utterly disarming as the sweet-tempered Dinah, who just wants to reconnect with life and reclaim her husband’s affection. Taylor and Zweifler make a riotous pair as the California cousin tries to expand Dinah’s palette of experiences and Dinah – sans her huffily withdrawn husband – gamely wields her dabbling brush. The odd man out in all this appears to be morally righteous, unbending Bill, played with contentious rectitude by Stephen Spencer. But here, as everywhere else in this remarkably unmoralizing tale, there’s more to the man than meets our impatient gaze. We’re looking at the tip of two marital icebergs. Eventually, “The Quality of Life” takes us well below the water line for a startling view of the whole truth. Within The Den Theatre’s snug performing space, and amid the refugee camp detritus of Henry Behel’s set design, director Lia D. Mortensen deftly melds four bruised hearts. It is stagecraft redolent with the life-healing qualities of humor, warmth and honesty. Saw the performance on Saturday, November 24th and it was fantastic. Mr. Johnson’s article covers it pretty well. It is funny, sad, thought provoking and intense. A lot to think about on the car ride home. All four actors were at the top of their game and I highly recommend it.